“You know, I had a secret ambition from my teens to be a missionary, but I didn’t tell anyone,” says Anna from Germany, a 27-year-old inclusive education specialist. This young woman, who now serves God in Albania with OM’s special needs ministry, sees how God brought her from across the European continent to Albania for the specific purpose of using her professional skills in a major city to serve kids and youth with disabilities—some of the most marginalised people in Albanian society. As elsewhere in the Balkans, lack of exposure and prejudice still lead many people in Albania to regard disability as a matter of stigma and shame, even divine punishment. For several years, God has put a passion in the hearts of OM workers there to bear witness to the truth—that people with disabilities of any type or extent are unique and precious in His sight, fully valuable as individuals and able to enjoy a relationship with Him. Professionals in health and education have not been raised with this point of view of those with special needs. Therefore, Christian teachers and therapists, who both understand these truths and can effectively implement therapies, can tremendously impact the society. “My journey here began in Africa,” says Anna. After leaving school in 2011, she spent a year teaching German to the kids of a missionary family in Burundi. One of their children had multiple disabilities; working with her helped shape Anna’s future career plan: training special needs children to help them in their development, including using inclusive education. Whilst Anna was studying in Germany, a friend, who had taken a break from his own teacher studying in 2015 to spend two years with OM in Albania to work with Roma children, invited some of their student group to come over to Albania for an outreach. It was then that Anna first came to Albania. 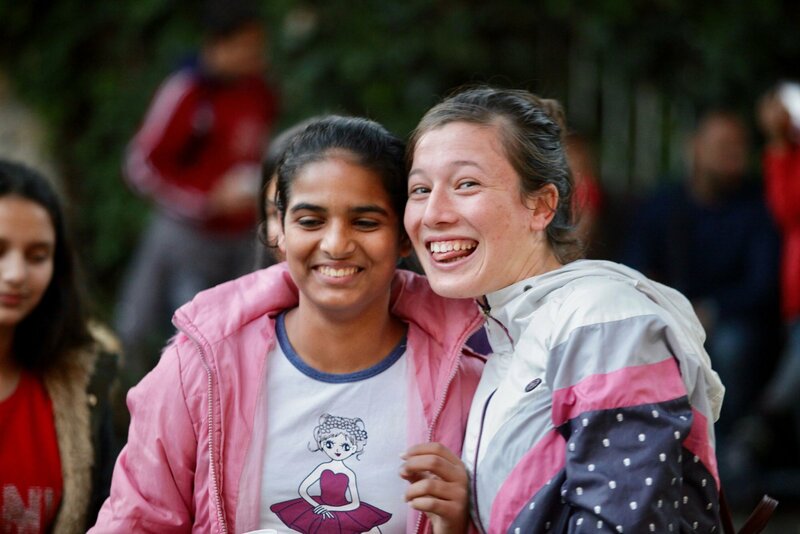 The Easter before Anna qualified in 2016, another group (along with Anna) came again, and she and another girl had the possibility to see one part of the special needs ministry in Durrës. “The leader of the special needs outreach challenged me to come and work in Albania straight away!” Anna recalls. But she preferred to get some professional experience first in Germany, taking a job after her graduation in a kindergarten for children with mental disabilities. One and a half years later, this job contract was drawing to a close, and Anna was praying seriously about her future—was missions what God wanted for her, and could she use her professional skills somewhere? Anna had not forgotten the challenge that had been given to her before to come and work in Albania. Additionally, a German friend, who knew Anna well and had visited Albania before, encouraged her to go. She told her how she had thought even two years before that Anna would fit well there—even before Anna knew about the special needs ministry. After this conversation, it seemed everything kept falling into place, including Anna’s home church being supportive. In January 2018, Anna arrived in Albania. Anna’s arrival has been a great boost for the OM Albania team. The highly experienced special needs teacher, who had restarted the OM ministry to people with disabilities around six years ago (and who had challenged Anna to go there in 2016) had returned to Germany in September 2017. The team had been praying for new colleagues with specialist skills to replace him, to carry the special needs ministry forwards. With her preliminary language study completed, Anna has started contributing to two key aspects of the ministry. OM and a local evangelical church reach out to around 10 to 12 families who care for their disabled children at home, through a combination of a popular weekly meeting called Sweet Mess (modelled on the Messy Church movement*) and/or frequent house visits during the week. In Albania, around 80 per cent of disabled children receive no education at all; there are only six schools for special needs kids in the whole country, offering 700 places (Unicef, 2014.) For most families who have a child with disabilities, therefore, the only help they get from the state is a modest monthly allowance from social services—no occupational therapy or physiotherapy, no adaptive aids or technologies. Lack of disabled access to buildings can leave children housebound. Families struggle on alone, doing the best they can to care for their children, but are hindered by the same lack of education and training that has thus far affected the rest of society. The house visits offer educational input for the disabled child, support for parents through a listening ear and practical help, and study help for siblings. Anna regularly does house visits and hopes to build deeper relationships with the parents; from a basis of trust she can more easily share professional insights, which, if accepted by the parents, could help in releasing the potential in their children. The second key area is deepening the existing level of involvement by the special needs ministry at the local state-run development and residential centre for children and young people, one of eight such institutions in Albania. There are about thirty young residents, aged anywhere from around four to 25, all with some degree of physical and/or learning disability or sensory impairment. While some parents do visit their children at the centre, some of the residents are orphans. Others have parents who abandoned them or could not provide the support and resources the children needed. Many of the care staff lack training; OM would love to see these carers reach their own potential, so that they, in turn, could help the young residents to develop as much as possible. Anna is excited that the director is open to her being there, and there have been discussions about the carers getting training. Anna is aware, however, of the challenges involved in building trust with the staff at the centre. She attempts to do her activities and therapy in a sensitive way that the carers can accept, since it does take time to build relationships, and the concepts and values are at times new to them. She hopes to see the staff later using the new skills and techniques they have learned in their daily interactions with the young people. Anna also hopes to expand the range of activities which OM undertakes. Currently, OM workers and members of the local evangelical church with whom they partner, go to the centre weekly. They have regularly escorted a dozen of the youngsters to a café in town and hosted a party for them for an hour or so—the only regular time away from the institution that many of the young people have during a normal week, which is, of course, a great highlight. This form of fun and attention has had a positive impact on the children’s social skills and behaviours. Please pray for Anna to have sensitivity, perseverance and wisdom as she develops effective and trusting relationships with families in the community and with staff at the state-run centre. Pray for language and cultural barriers to be minimised. Pray for professional skill to meet the needs of young people across a whole spectrum of disabilities and that she would be a source of great blessing. There are many hopes and expectations resting on Anna’s shoulders. If you have relevant skills, will you consider joining her in OM Albania’s Special Needs Ministry, as a volunteer or full-time colleague? Anna has now been working in the centre for four months, working with several children in individual sessions, helping in areas such as developing fine motor skills and cognitive development. The carers have started to show some interest in coming alongside Anna while she works with the children. Anna’s hope is not only for the children to keep developing, but that the interest of the carers to further develop the children will also increase. Anna continues with regular house visits, working with two special needs children who live at home. She is encouraged how things have come into place and is hopeful for her future ministry with these precious children. *Messy Church is an iniative of The Bible Reading Fellowship that offers a way of being church for families across the world involving fun and helping people encounter Jesus as Lord and Saviour.